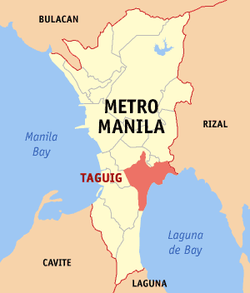 Where does Taguig got it's name? Is it taken from a hero in that place? Is it given by the invaders? Everybody's curious where the name Taguig came from. We thought that there's no story behind it's origin but in fact, there is. Elders say that Taguig's early inhabitants were good at threshing rice after harvest and by that, they were referred to as "taga-giik". In 1571, Spanish friars who reached Taguig found "taga-giik" difficult to pronounce, calling it "tagui-ig" so, it was shortened to "Taguig".